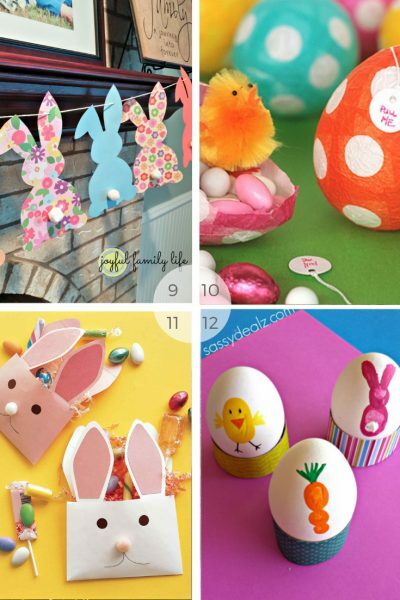 Looking for some kids Easter crafts to do these holidays? 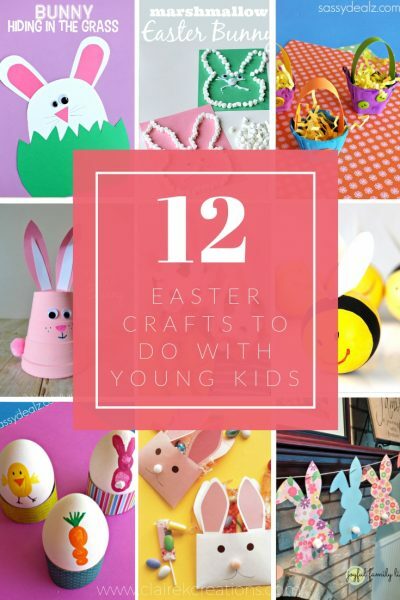 Look no further than 12 easy Easter craft ideas for young kids. This is my first every school holidays. I’ve been looking forward to it and a little bit freaking out about it for weeks. I’m not going to lie, school hit me hard. 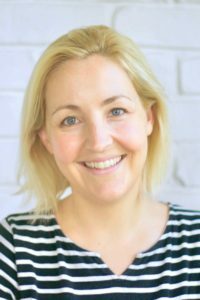 I haven’t worked in an office job for 10 years. That means I’ve never had to be somewhere at a set time every day of the week for 10 years let alone with kids in tow. Working for myself means while yes I need to get the kids to kindy so I can work, there’s not a massive rush. 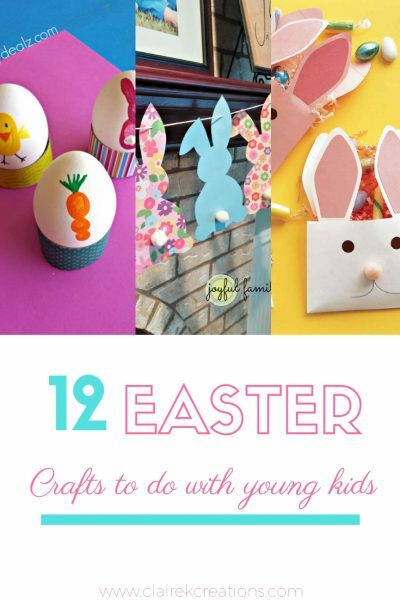 You might also like 11 Easy Easter recipes. If we take 10 minutes later, there’s no bell that will ring. No one will get in trouble or told off. Quite the opposite of school – it’s been quite an adjustment for me and the boys. That’s why I was so looking forward to a break from routine (well that and not having to pack school lunchboxes every day). 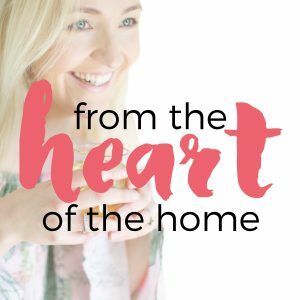 One of the things I love most about festive occasions is all the craft ideas they bring with them (yep I’m a craft lover at heart). I’m not sure what we’ll do in other school holidays but at least this time there are Easter crafts! 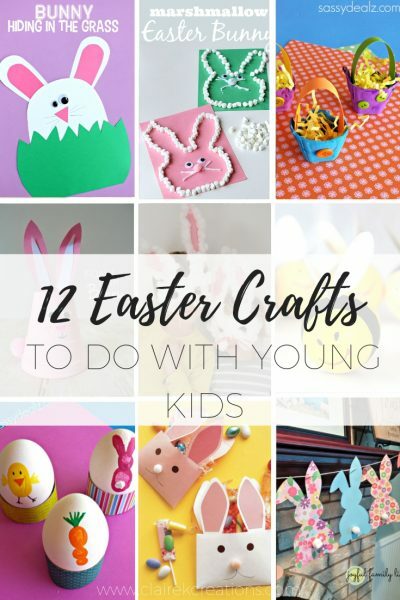 I figure I’m not the only one looking for ideas so today I’ve put together 12 kids Easter crafts that you can do with little kids. 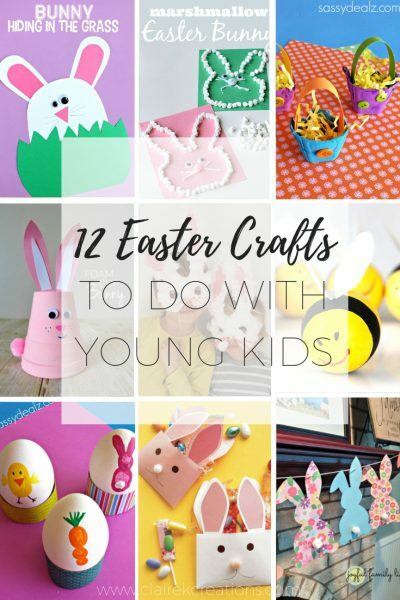 Cute little hidden Easter Bunny paper crafts from Crafty Morning are great for little fingers to practice their cutting and gluing. These foam cup bunnies from I Heart Crafty Things (you could use a paper cup or really any sort of cup!) could also be used to play a game of memory. Make three of them and pop a little ‘bunny tail’ (aka a little fluffy ball) under one. Move them all around and have your child guess where the ball is. 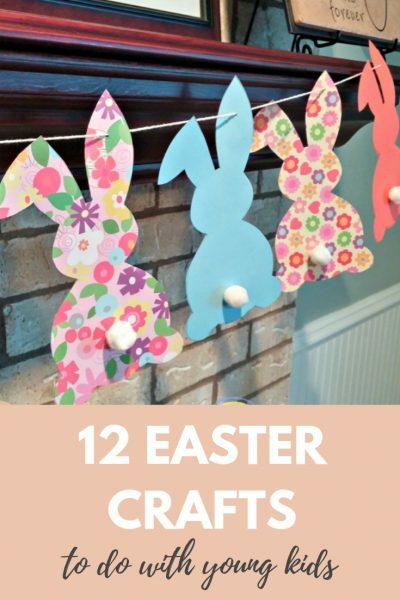 I’m not sure how many marshmallows would make it to the paper but my boys would love this marshmallow Easter bunny craft activity from No Time for Flash Cards. 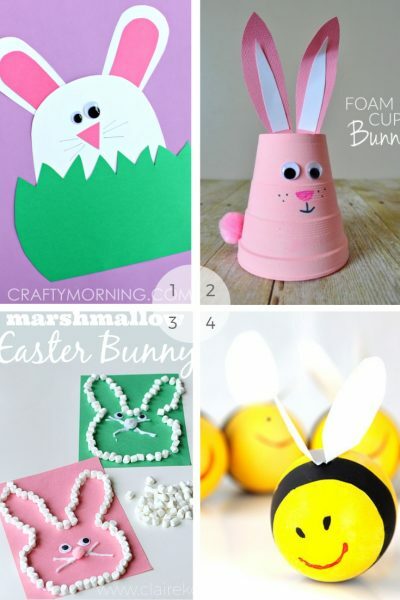 How cute are these eggshell bees from Mom Junction? They would have to be for kids from about 4 or really delicate little fingers. I’m pretty sure my 3 year old would smash them quick smart. An alternative would be using styrofoam eggs or even those plastic eggs you can fill with treats. Bunny rabbit bunting from Joyful Family Life would be a great threading activity for littlies. Depending on their age you could cut out the rabbits (my 5yo would love that job) then have them stick on their little tails and thread them on string. It really wouldn’t be a kids craft session without some egg carton craft would it? How adorable are these egg carton Eater chicks with the little babies in their mouths from Paper Plate and Plane? 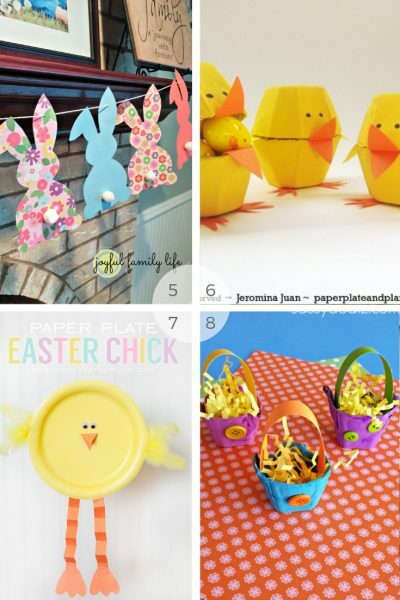 Still on the theme of chicks but one for the older kids perhaps, these paper plate Easter chicks from Simple as That Blog are pretty fun. You could put them on string to make funny little puppets too. If you’re not feeling brave enough to get out the paints, try and find some yellow plates or, get a whole lot of yellow tissue paper and have your child glue it onto the plate. Another egg carton craft, these Easter egg baskets from Crafty Morning would make a pretty cute gift with one hollow egg inside. Maybe one for your kiddoes if they just have a couple of kindy friends to gift to. I think I’d regret promising to make a stack of them! 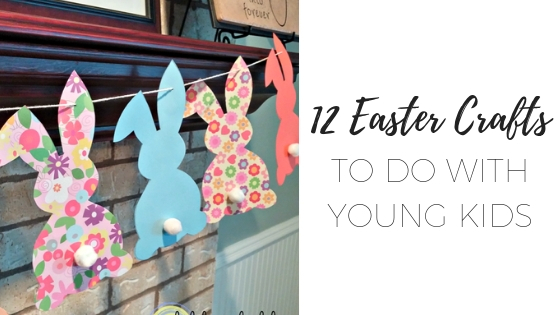 Bunny rabbit bunting from Joyful Family Life is such a cute idea to hang around the house. This year we have some bunting over our mirror. I’d probably add a few carrots and Easter egg shapes to break it up a little. 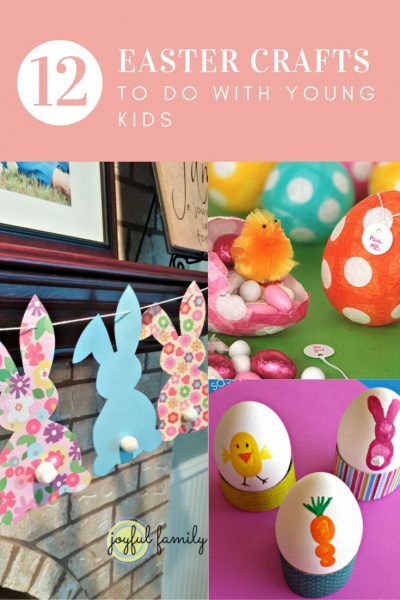 These papier-mache eggs from Not Martha would require a little patience for the little kids but they’re one that will last a few years if you have a little Easter tree to hang them on. Add some Mod Podge or glue on top to seal them at the end. My son made a couple of these Easter Bunny envelopes from Martha Stewart the other day (just so he could stash his own eggs!). These finger print eggs from Crafty Morning do require delicate little fingers but when the result is so cute I think they’ll try their best not to squish the eggs. Yes this does require paint on hands. One of my best tips for keeping crafting and paint reasonably clean is using a cheap plastic shower curtin as a drop cloth. Thank me later! What about you? 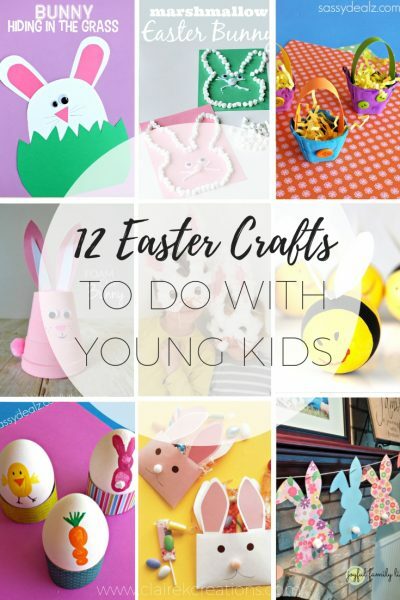 Will you be doing Easter crafts with your kids this year?